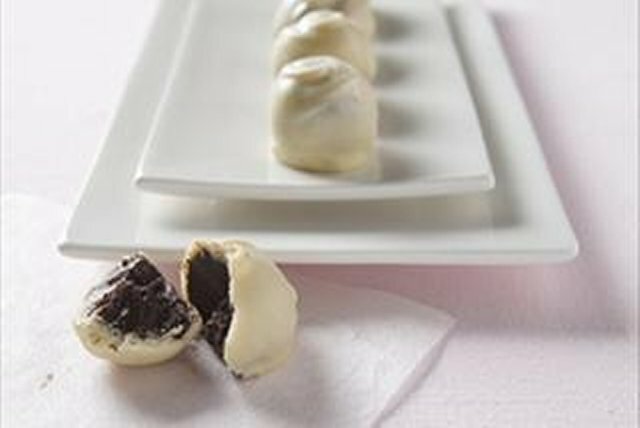 Nothing fancy needed to make these elegant Black Tie Truffles. Just bittersweet chocolate, white chocolate, whipping cream and butter. Microwave bittersweet chocolate, whipping cream and butter in microwaveable bowl on HIGH 2 min. or until chocolate is completely melted and mixture is well blended, stirring after each minute. Roll into 24 (1-inch) balls; place on waxed paper-covered baking sheet. Freeze 20 min. Melt white chocolate; cool slightly. Use fork to dip balls, 1 at a time, into white chocolate, turning to evenly coat each ball. Return to baking sheet. Refrigerate until firm. Chocolate truffles make sweet treats that are perfect for gift-giving or for serving on a special occasion.